The fabulous stand-alone Emperor Nautica Dog Grooming Bathing Station is made with an incredibly sturdy design concept, only the highest quality, treated polypropene materials resisting heavy usage and is therefore perfectly suited for professional grooming salons, dog grooming training academies and of course dog owners and show exhibitors even at home for personal use. 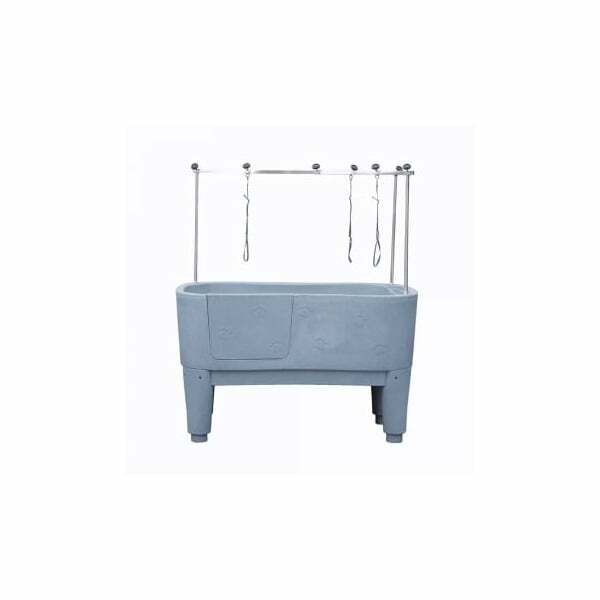 The Nautica Dog Grooming Bath is part of the Emperor Dog Grooming Product range, which is widely supplied in the United Kingdom and also in Europe. 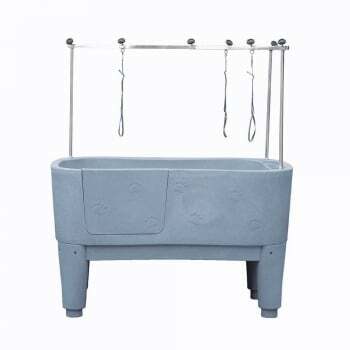 The standalone Emperor Nautica Dog Bath is a very trendy looking bathing station with four very chunky & sturdy feet allowing a good working base for the dog bath. The standalone Emperor Nautica Dog Grooming Bath also comes with a removable, non-slip platform, which transforms the bath into a bathing station for even the smallest dog. The black platform is completely removable, allowing you to use the entire bath for large, extra large or giant dog breeds. Whereas, when the platform is in place, an entire half of the pet bath is transferred into a dog bath specifically for toy, extra small and small dogs, as well as other pets such as cats or ferrets. The platform is non-slip with little fashionable paw prints embossed on its surface, making it both trendy and functional. The platform allows water to drain off into the main part of the bath and exit through the usual drainage system in place. The platform is designed to minimise the risk of backache, which would result if having to bend into the bath for the smaller dogs (if they were to sit on the floor of the bath). The removable platform measures approximately 26.4"/66cm by 24.8"/62cm in size. The entrance door of this bath easily slides up and out for easy entrance, and can then easily be closed by sliding it back into place to close the dog bath keeping the spray and water inside the bath (along with the dog or pet). Alternatively, it can also be used with the door open, as the dog bath sides are high enough to keep most of the splashes inside the bath. Lastly, it is worth mentioning that this very hygienic and easy to clean dog bath also has sunken in areas for the storage of shampoo or conditioner bottles at one side of the bath, allowing the groomer an easy reach for anything that is necessary whilst bathing a dog. The standalone Emperor Nautica Dog Bath comes complete with its own H-Frame, which has been designed for use with large dogs in the main bath or smaller dogs on the platform. It will also be supplied with three adjustable, grooming nooses. To sum up, this uniquely designed dog bath has not only design on its side, but also quality, functionality and practicality allowing dog groomers a 360 degree bathing access due to there being no restrictions from splash back panels. The incredibly functional elevated split level platform concept allows for the tiny toy breeds and smaller dogs saving backs from 'awkward-bending-into-a-bath' positions. This standalone Nautica Dog Bath will need to be plumbed into a drainage system, to allow the water to drain out whilst bathing a dog. The water inlet is up to the consumer, as it does not come with a shower system, but will allow groomers to use existing showering systems & power showers in wet rooms or grooming areas. It offers more flexibility to existing pipe locations and also which side the water inlet is to come from. Can also be used in sheds or outside for multiple dog owners. Afterall, health is the most important thing for us, so look after your backs. Happy human backs result in happy, waggy, CLEAN four legged friends - both on a professional and a personal basis. The standalone Emperor Nautica Dog Grooming Bath is normally available in Azzurro Dino Blue, Orchid Purple and Marble Grey. Please call us on 0844 800 9907 if you would like a specific colour, as colours are subject to stock availability. We will always attempt to fulfill your colour request, and you can drop us a note with your request during the order and checkout process. All sizes are approximate and may vary slightly. Colours are subject to change without prior notice.